I try not to get too caught up on playing games on my phone. I'm one that can get easily worked up over trying to pass a level and downright irritated when I can't. Luckily I've stumbled upon one I've actually found to be quite relaxing and a stress reliever at times. It's called Panda Pop. If you've never heard of it let me give you a brief overview. Basically just as the title suggests - you're a panda and you pop (bubbles). Yes there's a little more to it than that, but I said brief right? An evil baboon has kidnapped & trapped precious panda pups in the jungle. Strategically burst matching bubbles to help beat him & return the cubs to their worried mother! Unlock and discover dozens of beautiful worlds & over 500 challenging levels. Play among friends and see how you stack up. Fun & easy to learn. Challenging & rewarding to win! Characters, animations, and sound effects you will LOVE. 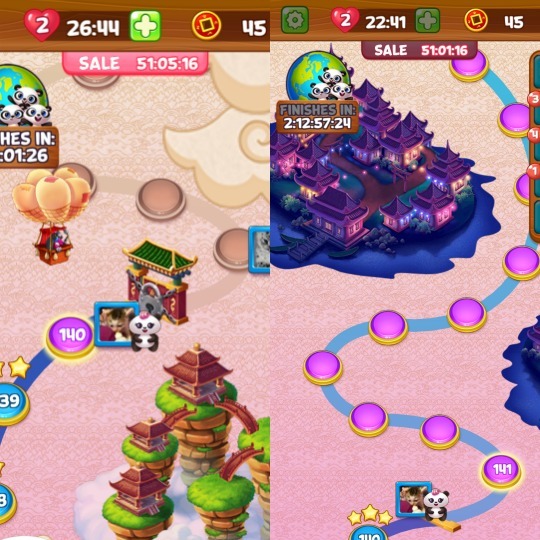 One of the things I like about Panda Pop is that as you play and move along the path of levels you get to automatically "unlock" the different worlds. Unlike most games where you have to have a certain number of friends send you a virtual key to unlock the levels. This always turns me off because some games I play others don't play often so I didn't get to unlock worlds until the timer ran down which could be days later. With Panda Pop you move to the door and it magically unlocks for you to keep on playing. Another thing I really like about Panda Pop is that as you progress along the path of levels you get different special powers that will then be featured on different levels. For instance on this one there are special bubbles that fill up your lantern all the way. A lantern gives you special powers too (that you unlocked back before this level). And if you play your board right you can activate all four lanterns at once and a mystical dragon comes on the board and blows up everything on your screen. Pretty cool right!? The final thing I want to point out about Panda Pop that's different than other games I've played is that as you progress to higher levels it doesn't necessarily mean eventually it will be so hard you'll want to quit playing. I'm up in the 160's and still am enjoying the game. Yes some levels are a bit more challenging, but none have made me say "I'm done, this is too hard". I have a few games on my phone I haven't played for months just because I got up so high and the level became so difficult I couldn't passed it after who knows how many tries. Thankfully Panda Pop has not been that way at all. 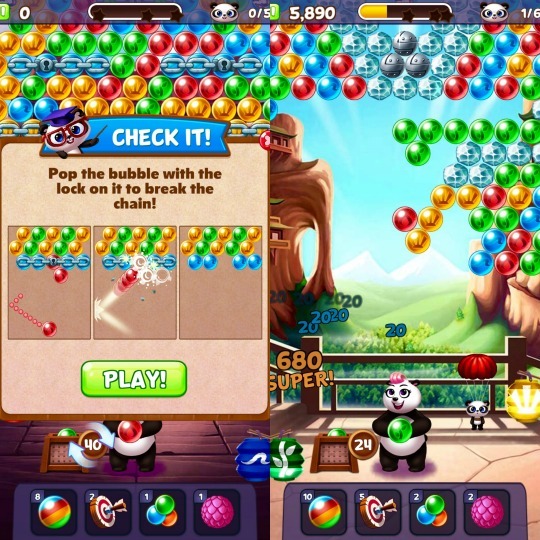 Have you played Panda Pop yet? If not you HAVE to check it out! 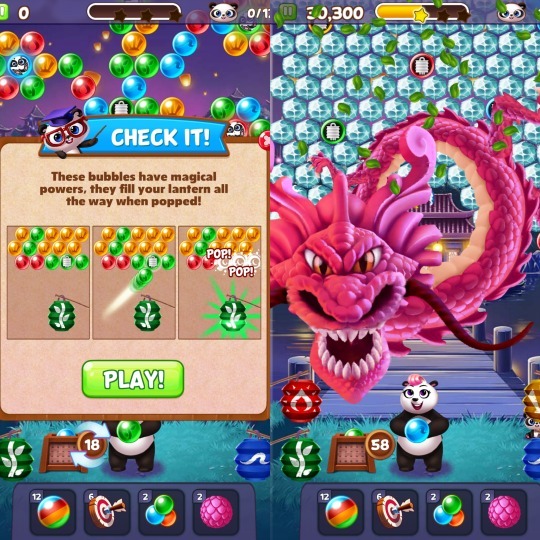 Panda Pop is available for IOS, Android, and Windows phones/tablets. This looks like a lot of fun to play, and addicting too! My kids would love it! I see both their favorite animals (dragons and pandas!)! That looks like fun - I'll have to try it!